Read this book before you write your thesis or journal paper! 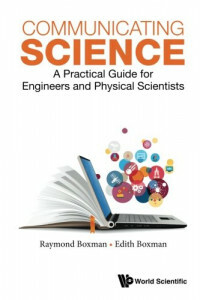 Communicating Science is a textbook and reference on scientific writing oriented primarily at researchers in the physical sciences and engineering. It is written from the perspective of an experienced researcher. It draws on the authors' experience of teaching and working with both native English speakers and English as a Second Language (ESL) writers. For the range of topics covered, this book is relatively short and tersely written, in order to appeal to busy researchers. Graduate students and early career researchers will be guided through the researcher's basic communication tasks: writing theses, journal papers, and internal reports, presenting lectures and posters, and preparing research proposals. Extensive best practice examples and analyses of common problems are presented. Advanced researchers who aim to commercialize their research results will be introduced to business plans and patents, so that they can communicate optimally with patent attorneys and business analysts. Likewise, advanced researchers will be assisted in conveying the results of their research to the industrial and business community, governmental circles, and the general public in the chapter on popular media. Researchers at all levels will find the chapter on CV's and job hunting helpful. The Writing Well chapter will assist researchers to improve their English usage in scientific writing. This chapter is oriented both at native English speakers, who have an intuitive command of English but often lack formal instruction on grammar and structure, and non-native English writers, who often have had formal instruction but lack intuitive grasp of what sounds good. Mentors will find the book a useful tool for systematically guiding their students in their early writing efforts. If your students read this book first, you will save time! Communicating Science may serve as a textbook for graduate level courses in scientific writing. Readership: Aspiring and practicing engineers and physical scientists.